Apple TV may not be the all-singing assault on the television market as envisioned by the late Steve Jobs, but far from treating it like the "hobby" as once described by CEO Tim Cook, the Cupertino company is pressing ahead with updates. Today, Apple TV software 5.3 has been released for the second and third generation iterations of the little black set-top box, and now, users will be able to catch content from HBO and ESPN right from the Apple TV, negating the need for any kind of direct cable subscription. Details after the break! In its press release on the matter, Apple was keen to point out that iTunes viewers are purchasing in excess of 800,000 TV episodes and more than 350,000 movies per day, which is certainly no mean feat. With that in mind, it’s unsurprising that rumors have suggested the fruit company will be delving further with a supposed connected TV effort, and although we’ve yet to see any of this rumor reach any kind of fruition, one suspects it is something Apple will bring in the future. Aside from the HBO Go and WatchESPN support, there’s not much else to report from the new update. According to the change log, three other content providers are now available on Apple TV including Sky News, Crunchyroll and Qello; each of which will begin offering "live news, sports and current TV programming." If you want to update to the very latest Apple TV firmware 5.3, you can do so the usual way, and by usual I mean the native facility provided from within your Apple TV interface. 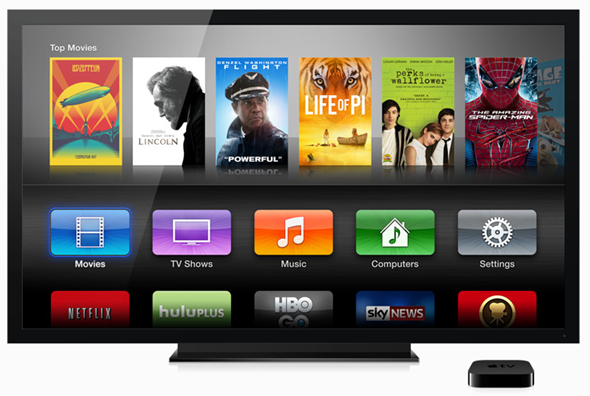 If you don’t wish to utilize this method, you can check the firmware file we have provided below, which in turn means you will need to connect your Apple TV to your computer and apply the update via iTunes. Whichever method suits, once you have gone ahead and updated your Apple TV to the latest firmware, be sure to leave your comments and thoughts on the latest update via the usual mediums below!